Are you looking for some really fun ideas of where to take your next timeshare rental vacation? 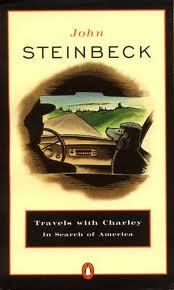 Fifty years ago this month (on September 23 to be exact), Nobel Prize winning author John Steinbeck drove out of town with his magnificent standard poodle named Charley, and began a road trip that resulted in a travel literature classic, "Travels with Charley." To celebrate the golden anniversary of this amazing travel duo, travel journalist Robert Reid has compiled a list of some of the spots where you can follow in the footsteps - or rather the tire treads - of John's and Charlie's pickup camper. Here are three, each near timeshare rentals. Rent a Wisconsin Dells timeshare - and fall is a good time for it. This state is as covered in the rich tapestry of colorful autumn leaves as anywhere in New England. While Steinbeck and Charley actually spent more time in Wisconsin hunting for the elusive "Swiss Cheese Candy," you can stay at the Dells and enjoy the incredible variety of activities and events there, or venture out on some day trips to try the famous Wisconsin cheeses. Also indulge in the state's lesser known but just as tasty product - maple syrup - perfect for those fall apple pancakes you'll be mixing up for your timeshare breakfast. The Big Easy was a favorite of Charley's, and who could blame him with all of the fantastic tastes and smells that emanate from this delicious town. Rent a New Orleans timeshare and indulge in the favorite pastime of locals and visitors alike - eating. There are few other places in the world where such a diversity of dishes is available in one single city. From rich paninis to spicy gumbo to the famous King Cake of Mardi Gras fame, you'll find it all in New Orleans. There are a number of California timeshare rentals within easy driving distance of Steinbeck's home town, and Salinas is justly proud of its famous favorite son. The historic downtown, called Old Town Salinas, is home to the National Steinbeck Center, the Steinbeck House, and the John Steinbeck Library. The beautiful Salinas Valley has some of the largest growers for the international floral industry, as well as rolling hills of famous vineyards. Charley, by the way, is buried outside the family’s former cottage in Salinas. When you follow the travel trails of these two intrepid vagabonds you're sure to discover the America that Steinbeck and his dog set out to find. And by renting a timeshare you give yourself the time to get to know each spot just a little better.